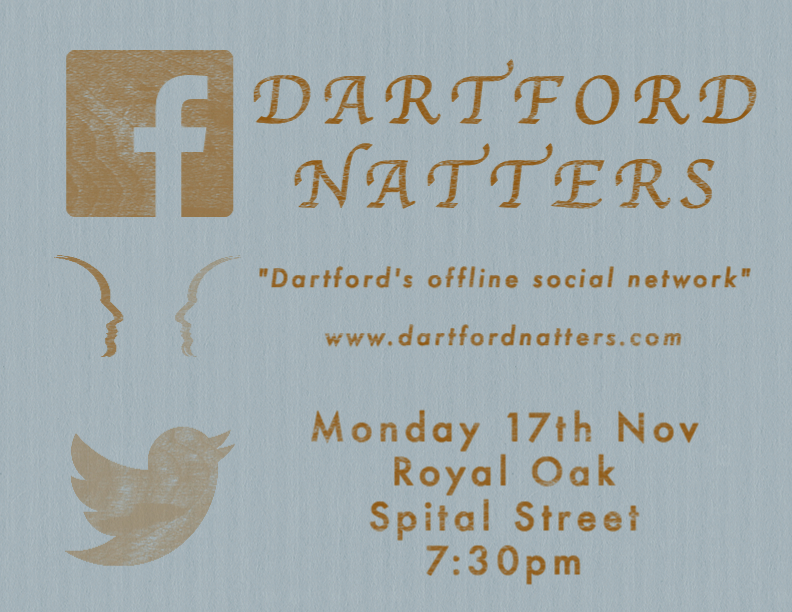 November’s Dartford Natters meet up. We are meeting again next Monday evening. These Natters seem to come around so quickly. There’s always a resolve to “publicise it more/better next time”. But actually a lot of the people who come regularly will notice the usual tweets and posts. There’s a page on the Dartford Matters site, which gives background on the monthly Dartford Natters events – and I usually point any reminders at that. So this post on my own blog is a bit of a stock-take. The first thing to say is that these events are always fun and relaxed. In spite of periodic misgivings about always meeting in a pub, it doesn’t seem to put many people off. Other venues would feel a bit sterile, and probably cost us money. That said, next summer I will put a bit more planning and prior notice into making at least one Dartford Natters into an afternoon picnic! [All offers of help gratefully received]. Next thing is that we do always get new people – so if you might be a ‘new people’ yourself, don’t worry that you are going to walk in on a clique of people who’ve all known each other forever. The idea of making this a ‘group of groups’ is also working, as we have had representation from Dartford Big Local, Dartford Arts Network, Litterpickers, Dartford Living, Dartford Hour, Dartford Matters itself, and the Round Table. [Though we have a systematic diary clash with the last of those, that needs some attention]. These people in turn also get to interact with local Councillors who make an admirable effort to turn up even when they have meetings during the same evening. We also have some prospective candidates for next year’s elections. We have some identifiable representation from Facebook groups – notably Dartford Community Group, though that’s partly down to its strong association with the Round Table. I always get nice feedback on my posts to other places on Facebook – e.g. from the Dartford Remembered group. But we haven’t had anyone come along from Dartford Remembered, or from Dartford Past Present and Future, and say that this is why they are there – i.e. to connect those FB groups to what’s going on in the offline world. All of which is fine, of course, it just confirms that these are online social media forums – places to talk and share every day of the month – rather than groups for action. Please leave a comment below if there are other local groups, online or offline, that I should be inviting to come along and connect in this informal setting. Again, it’s important for me to emphasise that although Dartford Natters is helping to spark, or deepen, connections between local groups, it’s also a gathering for individuals who care about the town. Above all this is a social event. There will be politics, because that’s what happens when you talk about something you care about. But there isn’t an excess of Politics. Occasionally we may make something happen, but our ambition is just to meet, be welcoming and open-minded, and see what happens. I hope to see you at a Dartford Natters some time soon.